The Hound’s Tooth Expansion Pack brings this infamous freighter to life as a towering, large-base miniature starship for the Scum and Villainy faction, rendered at the game’s standard 1/270 scale. You’ll also find four YV-666 ship cards, a new mission, and thirteen upgrades, including the Hound’s Tooth Title, which allows your YV-666 pilot to survive imminent destruction by escaping aboard the Nashtah Pup, a unique Z-95 Headhunter. 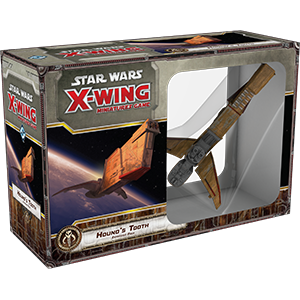 The Hound’s Tooth Expansion Pack also comes with a ship card for the Nashtah Pup and the rules for deploying it, though to fly it, you’ll need the miniature starship from the Most Wanted Expansion Pack or Z-95 Headhunter Expansion Pack.